Don’t Look Down – Highlining in Sutatusa – Where is Lydia? The hostel was set in a beautiful lush countryside. It took my breath away. I had no idea Colombia’s flora would be this lush and green! Hedi said it reminded her of the Austrian countryside. The only downside to this lush green paradise is that it’s freezing cold at night, so if you go make sure to pack warm clothes! There are no shops or restaurants within waking distance, no WiFi, and pretty much no neighbors for that matter. Make sure you bring your own food. There’s a kitchen to cook in but no refrigerator. Jorge, Chris, Guy, Hedi, Ästa and Alejandra eating a hearty breakfast before we head up into the mountains to highline. In addition to Alejandra’s friend Jorge, a Canadian named Guy came to highline and brought a guy from Austria named Chris. Hedi had met Chris at her hostel in Bogotá and had no idea he would be there. It’s crazy how small the world actually is and how often you run into people again you have met through your travels. The next day the seven of us hiked up into the mountains to learn all about highlining. Highlining is slacklining but high in the air as the name would lead you to believe. I thought these people were crazy. They were going to walk across a thin rope 100 feet in the air? Insanity. Hedi, Alejandra, Asta, and I sat quietly watching them set up. Jorge attached one end of the rope to a boulder and then the other end to another boulder about 30 feet away. The winds were very strong that day. Jorge, the hostel owner and highline professional, wasn’t worried a bit. He often highlines without a safety line, meaning he could fall to his death at any moment. Thank god he chose to use one that day. It’s never a good idea to look down. Watching Jorge walk across the highline was both terrifying and exhilarating. He probably feels exactly the same way up there. We spent the day mesmerized watching Jorge, Guy, and Chris attempt to walk across the highline. Jorge was the only one able to stand up on the line, as well as actually walk across the entire length of it. Having tried to slackline on the ground and knowing I couldn’t even stand up on the line, I didn’t attempt the highline. I did however get in a harness and pull myself out on the line. I’m absolutely terrified of heights so this was a really big step for me. I couldn’t believe it was only my third day in Colombia and already so much had happened. If this was what the rest of Colombia had in store for me, I was game! From Portal Norte in Bogotá take a bus going towards Ubate or Chiquinquira. Get off at Sutatusa. You can ask the bus driver to tell you when it’s your stop. Hostal Quinta de Fagua is only open if the owner Jorge knows people are coming. You can call him at +57 310 5552164. He also has a website www.quintadefagua.com where you can get more information. Sutatausa is a beautiful town out in the serene countryside away from all the hustle and bustle of Bogotá. Just enjoy the nature. 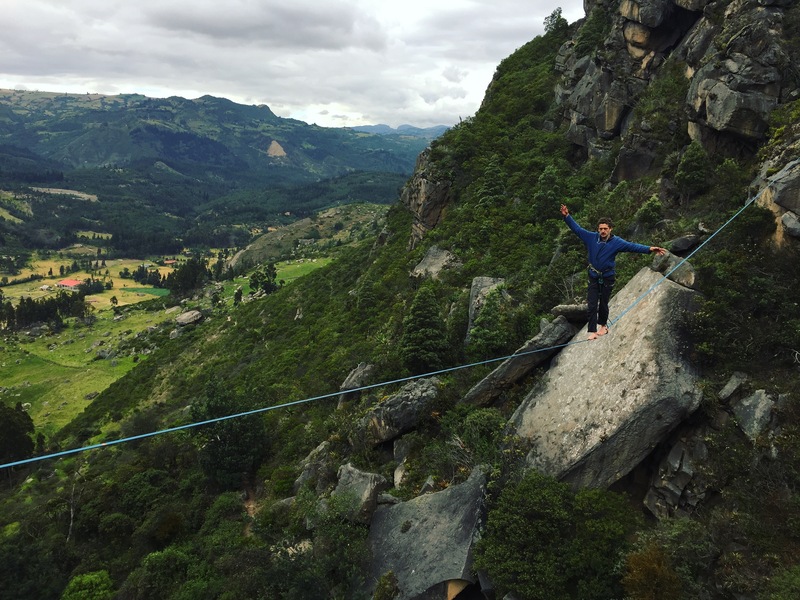 There are many hikes as well as highlining you can set up with Jose. He even offers lessons. That is living on the edge! Wow! Brave and a bit crazy!